EXCLUSIVE ART! 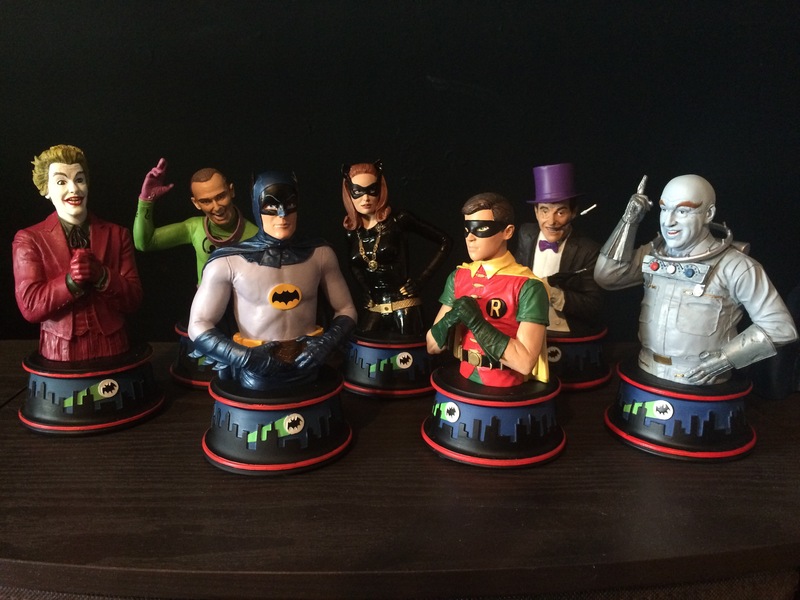 We go behind the scenes with the artist and sculptor responsible for the popular series of Batman ’66 busts. 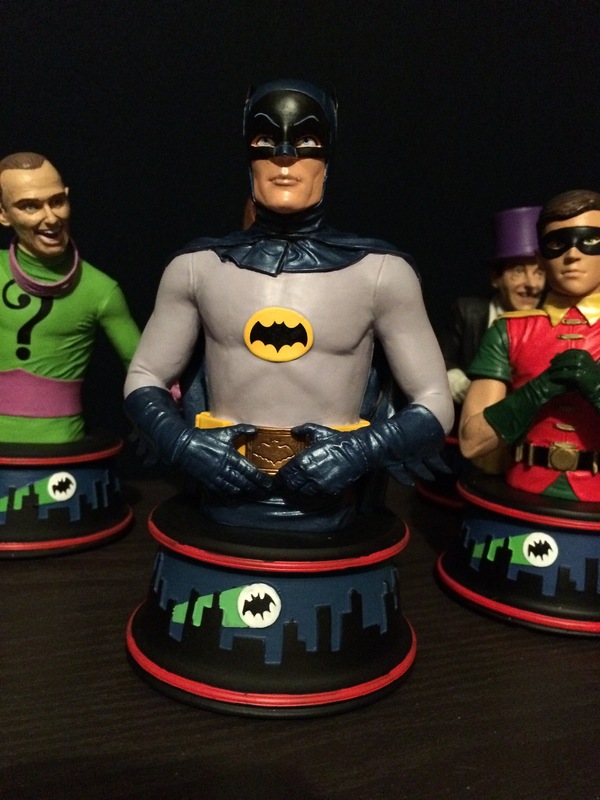 With it being Adam West’s birthday, it only made sense to trot out a new installment of our series BUILDING BATMAN ’66, where we lift the veil on Diamond Select Toys’ popular line of busts and banks designed by Barry Bradfield and sculpted by Jean St. Jean. — For more Adam West Birthday Bat-stravaganza, click here. Barry Bradfield: One of the first roughs I drew was of Batman punching, but it was decided that it seemed a bit off. Because this version of Batman isn’t a martial artist, a view of a punch with just the upper body showing seemed a bit stiff. The pose lent itself to a full statue rather than a bust to really get the movement across. 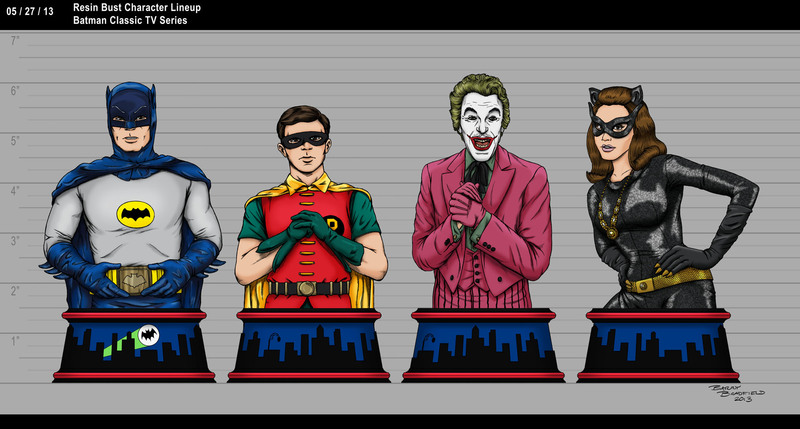 I think if it were exaggerated more it wouldn’t end up looking like Adam West either. Because of this, a standard heroic pose seemed best. Jean St. Jean: On the first Batman and Robin busts, I wanted to capture the feeling I had when I first saw the Dynamic Duo on television as a wee lad! I saw them as serious and heroic, so the concepts reflected their classic superhero stances. Dan: What’s the toughest part about capturing Adam West? Barry: I think for me it was less about his likeness and more about how the costume fit him. It’s so wonderfully made and yet you never think about how Bruce Wayne made it. He’s just Batman when it’s on. I wanted to make sure it didn’t look absolutely perfect since it wasn’t sculpted rubber. (It was “Pure West” after all!) I was sure to keep the gloves wrinkled, the seams showing, and the neckline of the cowl asymmetrical. I think those little details need to be in there to make sure the charm of the costume’s design comes across when you see the bust. Jean: The volume of the cowl in relation to his actual head is deceptive, until you actually see how much space there is from his eyes to the front of the cowl. 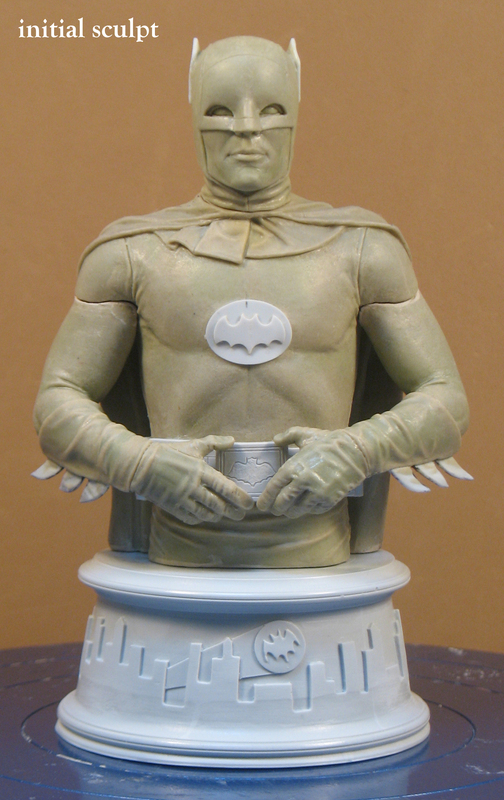 The proportions of all the design elements of the cowl overall are tricky and critical to the essence of the ’66 Batman. Capturing Adam’s likeness with just the eyes and the lower part of his face was also a challenge. Jean: For some reason, the episode where Alfred dons the Batsuit to convince everyone that Batman and Bruce are two different people. I just thought that was so cool when I was a kid, seeing everyone fooled by Alfred. I also always loved seeing the Batgirl cycle tear across the screen in the opening, because I loved her! Barry: That’s tough, since there’re so many. The first I saw of Adam West’s Batman was the movie, so it still holds a special place in my heart. I was swept up in 1992’s Bat-fever with the release of Batman Returns closely followed by the premiere of Batman: The Animated Series. At the time, the only version of the ’66 show available was the movie on VHS. About a year later, the classic TV series began to air every weekday afternoon (in syndication), so that’s when I got into it. If I had to choose one episode… I don’t know if it’s my favorite overall, but the first one I thought of was actually the False Face episodes. I think they are overlooked because the character only appeared that one time, but he’s so over the top it’s fantastic. I remember never being concerned for Batman’s safety when it came to the cliffhangers, but this one, with him tied to train tracks, seemed more real. I thought he really might not get out of this one, even though I could tell at a young age that the train was just a stage light in the darkness. There’s a certain creepiness to those episodes too… a lot of weird imagery. False Face was much scarier than the Joker to me!